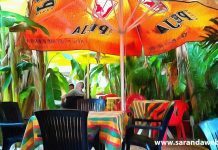 I am proud to be a solo traveler and two months ago, I find myself walking along the streets of Saranda, looking for a treasure. Well, not the treasure that you know but something that will make my stay in this Albanian destination even more memorable. 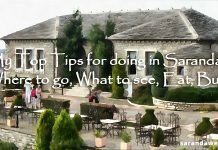 It does not mean that there is nothing extraordinary in Saranda because the truth is, there are plenty of amazing things to do around the place. It’s just that on that fateful night, my feet seem to have their own mind. 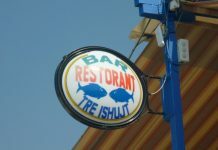 I was already feeling a bit hungry when out of the corners of my eyes, I saw the sign of Bar Restaurant Aragosta. It was right on cue, like in the movie, so I smiled a sheepish grin and eagerly sauntered to the doors of the restaurant. I was greeted by a friendly hostess and she brought me to an available table. She asked me if I am waiting for someone and I said no, I am pretty much on my own. She gave me a menu and I was quite impressed by their delectable selections. After several minutes of contemplating on one dish after another, I decided to go for seafood linguini, fried shrimps, meat, fresh salad and vegetables, and for something sweet, I chose their homemade caramel ice cream. The hostess smiled warmly at me. She was probably thinking that I am starving but well, I didn’t hide the fact that I really was. After just a few minutes, my foods arrived, aside from the dessert which will be served after I finished everything on my table. Judging from the presentation and the smell of the meals, it wouldn’t take me long to eat them all. My stomach growled from the sight alone so I decided to give it a go after the server left. The linguini was more than perfect. In fact, it was the best I’ve had in years, with the seafood obviously fresh. The fried shrimps are also very tasty and the meat combined with the fresh salad and vegetables was such a taste of heaven. I enjoyed every single bite that I took and when the server offered me white wine, I didn’t object especially when he said that it goes well with my meal and man, he was right on point. And just when I thought that the night couldn’t become better, the homemade caramel ice cream just blew me away. It was so great that I found myself devouring it in a matter of minutes. Should You Check Out Bar Restaurant Aragosta? I definitely don’t see any reason why you shouldn’t visit Aragosta for yourself if you happen to be in Saranda in the future. After the whole meal, I was more than satisfied and told myself that I just found the treasure I have been looking for. With such an amazing service, heavenly food and budget-friendly prices, this is one restaurant that I would love to visit over and over again.